We have arrived a few definitions for the web in the last few years and I believe we are finally getting to a point where there is enough differentiation that we can think practically about the impact of each component of the web as we know it. I have spent a lot of my time thinking about the Social Web and what that means for business and the web in general. It would be hard to argue that Social has not arrived — it is clear that it has. While there is still a lot of maturing to do on the enterprise side, consumers are leading the charge in establishing social as a primary component of the web. The Mobile Web has grown at a stunning pace in the last 5 years and continues to break new ground. Much of the excitement around the Mobile Web has been focused on the iPhone, but there are other trends that are having a real impact. Mobile is driving much of the consumerization of IT and mobile apps for the enterprise continue to be a foothold for more creative uses of the web by enterprise IT. Until now the concept of the Real-time Web has been relegated to being a euphemism for the rapid delivery of data streams to the end user. “Real-time Search” for example is focused on delivering the same search results more rapidly. 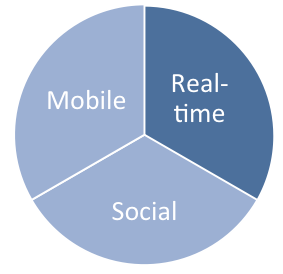 Real-time has not as of yet matured to the point where it is widely regarded as a category. In fact, Wikipedia defines the Real-time web as “a set of technologies and practices that enable users to receive information as soon as it is published by its authors, rather than requiring that they or their software check a source periodically for updates.” That day is coming quickly however. I would argue that the opportunity and function of the Real-time Web is largely misunderstood today, much as the Social Web was when it first began to emerge. The opportunity for the Real-time Web is to create intimacy and awareness. Where the Social Web gave us a wealth of relationships across a great breadth, and the Mobile Web gave us an immediacy of relationship, the Real-time Web will allow us to connect more closely with those we know with a higher fidelity interaction. Of course, these are pillars of a single web, and there is a significant amount of overlap between each one, but as we continue to better understand each pillar more clearly in its own right, we are able to see new opportunities that may not have been possible with a singular view of the web. The advent of Real-time brings with it some very new and compelling opportunities. For a long time now we have mixed “collaboration” in as a use case for the Social Web, but so much collaboration is actually in real-time. That is why we have meeting rooms and why the phone continues to be so useful. So far the software that enables Real-time collaboration has been limited, bulky and poorly executed. It has all been built as a native application (think Screen Sharing, MS Groove, etc). We are however finally at the stage where we can deliver Real-time on the web at scale. As a sort of Friendster of the Real-time web Google Wave was the sacrificial lamb of the Real-time Web. A beautiful and inspiring first experiment in creating a Real-time experience at scale, it was an incredibly intimate and deep experience as a user. The quality of the interaction was evident but the main problem was that we assumed that all of the use-cases of the Social Web applied in Google Wave. There was no framework by which users could determine what problems to apply Wave to and it became too uncertain of a place. “Should I be here?”, “What am I doing here?” — we didn’t know why we were using the Real-time web. Perhaps, to be crass, Google Wave’s technology should have been applied to dating. It might have made more sense to an initial audience. 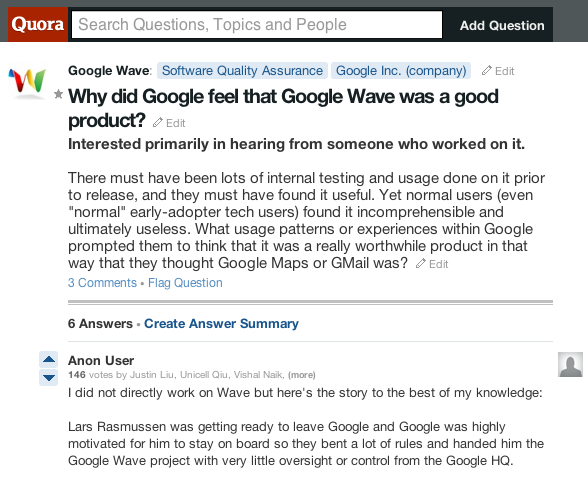 Unlike Wave however, Quora has begun to integrate more and more of a Real-time experience in to their application. As other people are responding to a question, voting up and answer or completing other tasks, Quora tells you in Real-time what is going on and who you are interacting with. It is a very engaging experience and creates a new sense of life within the application. It is a subtle but important use of Real-time. The Real-time Web has a long way to go but I suspect that the rate of its growth will be rapid. As Mobile and Social experiences have become incredibly pervasive in the last 5 years, Real-time will leverage that critical mass to catch up very quickly. Enterprise process is dominated by finite tasks. As social software has been making inroads in to the enterprise we have seen an attempt to utilize socialization of process and software as a way of adding value to those process. The problem however is that they are fundamentally tasks which need to be completed directly. The Social Web provides an overarching context (“who should be completing the task”) but it does not provide a better way of actually completing that task and moving on to the next one. A combination of Social and Real-time technologies give us an opportunity to leverage what we have developed with social software inside the enterprise. Real-time collaboration on the web inside the enterprise is currently limited and it is not pervasive. It is limited to single applications (such as Webex, Gotomeeting, etc) which are catch-all solutions based on arcane technology. Future Real-time applications inside the enterprise will be more pervasive and integrated with existing Social and Mobile efforts. Gaming is the one place where the Real-time Web has had a foothold for a long time. Social and Mobile are only really coming to gaming now, but MMPOGs have been around for over a decade and multi-player gaming continues to be very popular. Facebook already has Facebook Chat, but I think you will see them take a page from Quora’s book and more tightly integrate the real-time experience. Rather than having new Wall Posts streamed to you when they are complete, you will see “John M. is currently typing . . .” when you visit a wall and it will give you a better sense of the existence of other users as part of an ecosystem, rather than as simple content-producers. There are natural limitations to the application of Real-time Shared Web Experiences, but there are many. The applications are endless, but they are also vertical. Where social can be effectively applied to broad problem sets, Real-time is necessarily narrow but deep. There will be no “Real-time for busineses [linked-in]” or for Dating, but instead there will be applications of Real-time within those and other domains in order to accomplish outcomes that were not previously possible. So I have to ask Euan, Rob, JP, Susan, Andrew, Ross, Jeremiah, Ray, Dennis and others who have all been instrumental in definining the Social Web for me: What does the Real-time Web mean to you? Previous: Previous post: E20 vs Social Business? I am not sure I agree that social tools only give context rather than helping carry out tasks. Work for many people is “knowledge work” for want of a better phrase and “doing” things mostly involves thinking and writing and social tools can help both of those activities. I always struggled with the blur or IRC and even find the real time aspects of Quora hard to cope with. I reckon we’re going to end up with an ecology of tools that we dip in and out of for different purposes at different stages of whatever process we are involved in. Real-time is a loaded term. Is TV in the USA real-time after Janet Jackson? If you don’t trade stocks, is a 15 minute delay in stock prices significant to you? Does a real-time general ledger make sense? Waiting faster is not necessarily valuable. To me real-time is like simplicity. Keep everything as simple as possible. And no simpler. Keep everything as real-time as necessary. And not an iota more. Interesting post, Jevon, and a lot of good food for thought. I think you really hit on it when you talk about the realtime web in the context of collaboration. We’re seeing the beginning of a very powerful new way for communities to self-organize around a specific, time-based opportunity. The potential applications and their impact on existing social, business and community structures are enormous. One of the hurdles for real-time in organizations is it often requires going to a 3rd place (e-mail and regular work interface/tool are 1st two interfaces) to see and participate. Many social tools face this hurdle it requires a new pattern and developing a new habit and additional effort. This problem gets compounded when it is real-time as time matters (approvals, review, sanity checks, feedback while a person is asking a question in a meeting, etc.) have short relevance windows. The other need with real-time is filtering, particularly when used in an active mature social environment with high volume and velocity of information flows. Few services deal with this well even when immediacy is not as relevant. All of this is based on many assumptions around needs being met, understanding what in organizations requires real-time, embracing the many synchronous platforms that currently exist in organizations (MS Communicator, IM/Chat, phone, virtual meeting, live forum services, internal SMS services, etc.). Ah, the other essential piece that many real-time and near real-time services miss it the need for storing/archiving, searching, aggregating, and integrating the information in these services into the next stages (lessons learned documents, process / product changes, white papers, reviews, etc.) of information flows. Many services replicate the Facebook problem of anything said more than a week ago becomes painful to resurface, let alone reuse, or hold onto. These three pillars constitute a Web 2.5 at best. Another pillar or set of pillars are the semantic web and machine learning, with all the automation made possible with them.